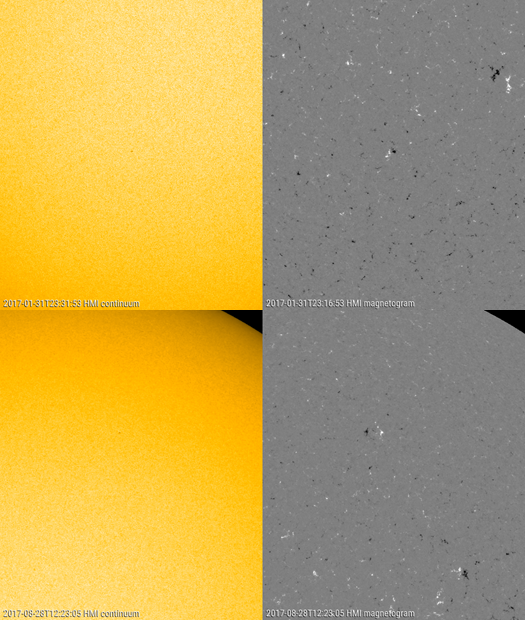 A sunspot group of the new solar cycle (SC25) emerged around noon on 9 April, and had disappeared by noon of the next day. It concerned a tiny region at a latitude of -31° (i.e. in the southern hemisphere), and has not received a NOAA number yet. It was observed by the Mount Wilson Observatory on 9 April and by a number of observers from the SILSO network on 10 April. It would have been only the third numbered sunspot region of the new solar cycle (see images underneath), and the first SC25 group at high latitude with the correct magnetic orientation. Indeed, the previous SC25 groups were observed in December 2016 at a rather moderate -23° (NOAA 2620), and in January this year there was NOAA 2694 at a high latitude (-32°) but with the "wrong" (SC24) magnetic orientation. More on this odd configuration in this STCE Newsitem. 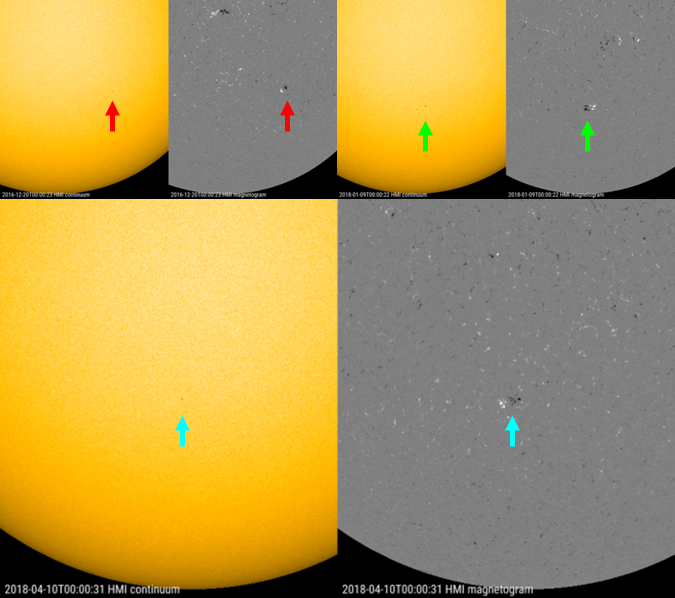 In all three cases, it concerned tiny sunspot groups lasting only a day or so. The diagram underneath displays for each month since 1974 the latitude of every individual sunspot group (NOAA number) that has appeared. 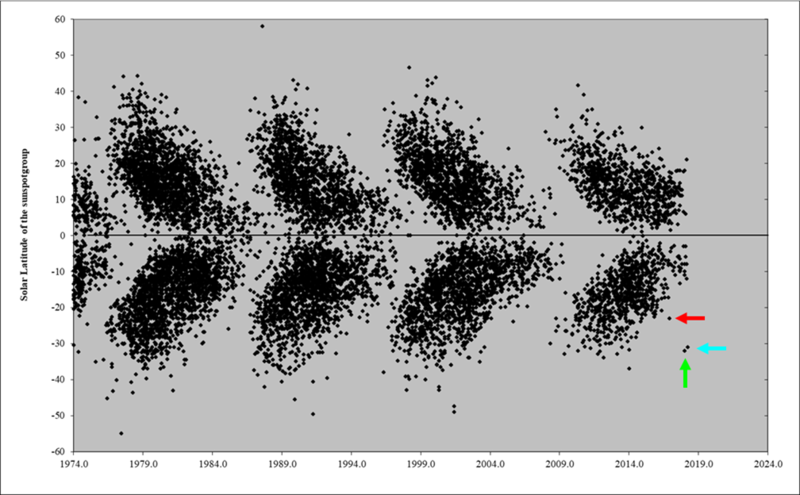 It clearly shows that as a solar cycle is heading for the next minimum, the sunspot groups appear ever closer to the solar equator, gradually becoming smaller and disappearing while the sunspots of the new solar cycle manifest themselves again at high latitudes. As the pattern resembles the wings of a butterfly, it is called a butterfly-diagram. The first such butterfly-diagram was published by E. Walter Maunder in 1904. The position of the three SC25 groups have been indicated by colored arrows. Though it is not so easy to observe these tiny sunspot regions in white light, they can quite easily be identified in a magnetogram of the solar disk. A magnetogram shows the locations on the Sun with a strong magnetic field, white being a location where the magnetic field is coming out of the Sun, and black where the magnetic field is returning to it. Well-known features are that sunspot regions are bipolar (i.e. they usually consist of a "black" and a "white" portion), that sunspot regions in the northern hemisphere have opposite polarities than those in the southern hemisphere, and that sunspot regions of a new solar cycle have magnetic polarities opposite to those of the old solar cycle. This is illustrated in the sketch underneath. Sunspots of the old cycle (SC24) are still appearing in the pink-shaded region close to the solar equator (on the average about 10° away). 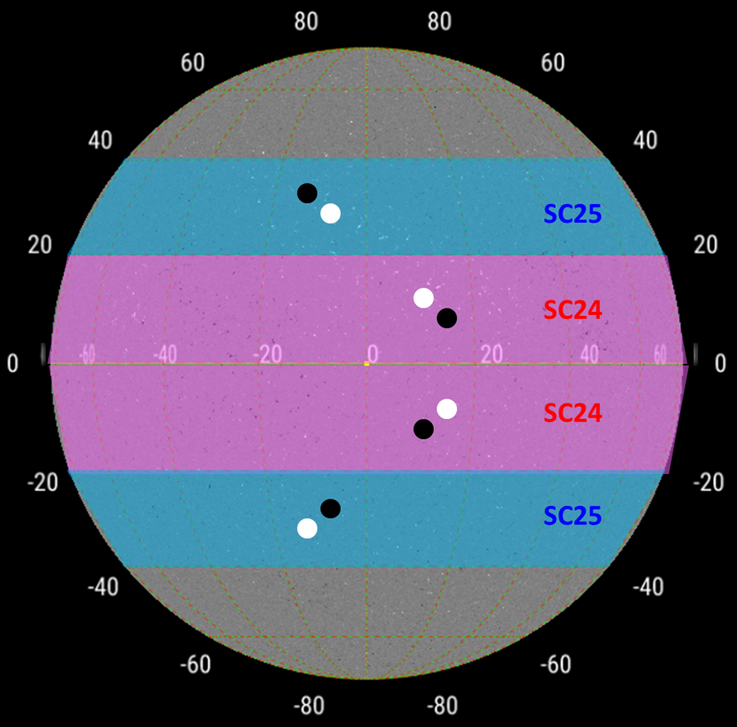 The leading spots in the northern hemisphere have a negative ("black") magnetic polarity, opposite to the leading spots of the SC24 sunspot regions in the southern hemisphere which have a positive ("white") polarity. Meanwhile, the sunspot groups of the new solar cycle (SC25) appear at much higher latitudes in the light-blue shaded region, i.e. mostly between 20° to 40° away from the solar equator. Within the same solar hemisphere, the SC25 groups have a magnetic polarity opposite to those of SC24, e.g. in the northern hemisphere resp. "white" leading spot vs. "black" leading spot. Note that the pink and light-blue areas are indicative only and do not represent cut-in-stone barriers. As the solar cycle minimum is getting near, the number of sunspot groups from the old cycle (SC24) will gradually decrease, whereas the number of SC25 sunspot regions will gradually increase. 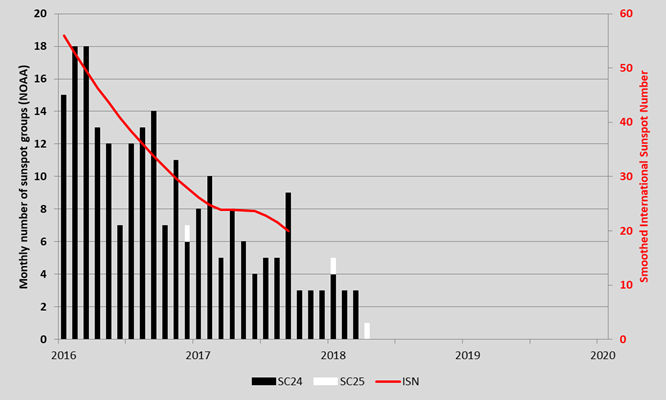 The graph above shows the monthly number of sunspot groups (having received a NOAA number) from SC24 (black) and from SC25 (white; here the 9-10 April region is considered as a SC25 group) since 2016. The red curve represents the smoothed monthly international sunspot number (SILSO). While the number of regions is low so close to the solar minimum, SC25 sunspot regions will gradually become more numerous than the SC24 regions. The cycle minimum usually occurs within just a few months of this "break-even". With the current evolution, it looks like this may happen within the next year, making SC24 both a small and short solar cycle (see also this STCE Newsitem). Meanwhile, the tiny sunspot group from 9-10 April has disappeared and will most likely not go down in the NOAA archives of numbered sunspot regions. It is not the first region nor will it be the last that suffers such a fate. Other examples were the tiny and ephemeral regions that appeared on 31 January 2017 (-25°) and on 28 August 2017 (+43°), resp. top and bottom in the figure above. These regions were visible for only a few hours, significantly less than the 9-10 April region. During the previous solar cycle minimum, the solar observing community came up with a (non-official) name for these really small and short-lived groups: "Tiny Tims". If you have to wipe your PC / laptop screen to verify if the feature you see is a true sunspot or a dust particle, then it just may qualify as a Tiny Tim. As the magnetic fields of SC25 gradually strengthen, the Tiny Tims will eventually give way to genuine (numbered) sunspot groups, and the new solar cycle will have truly started.